pretty sure was an intelligible stream of curses. He stepped back over the field, moving past the rocks and uneven lumps in the grass, blocking each of her attacks, but he could not bring himself to actually attack her. He looked helplessly at the sky, silently asking asking if we were sure this was his opponent. A little paper appeared in his hand. Yes, it read. With kind regards, the YAFST. He sighed, stuffing it in his pocket. “Stop looking at anything else. Fight me!” Thorgil screamed, making a slice for his neck with her axe. 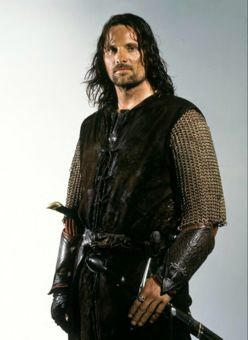 Aragorn ducked. He blocked a particularly vicious blow from her axe. "I cannot fight you. You do not deserve death." mouth too, one to rival even Gimli's. That thought made him smile. But she must have thought he was laughing at her, or going easy, because she screamed and came at him the harder. Now he actually had to fight to drive her back. Do I actually have to kill her? The thought tore him up. He couldn't do it. Not a girl, and certainly not a child. To his surprise, another scrap of paper appeared in his hand. No, was all it said. He smiled and nodded to no one in particular. In an instant he spun and was behind her. A soft tap of his hilt and she was out. Aragorn breathed a sigh of relief. He picked her up and moved her over to the shade where she could wake in peace, or whatever peace was in that raging body, then moved on to a place he did not know.